Imagine a world where little league parents did not exist. A world where kids (and parents) can just live in the moment and not in unrealistic expectations. If more fathers like Phillies fan Steve Monforto were around, this could just happen. Thanks for U.S. Navy Academy Assistant Sports Information Director Jonathan Maggart for highlighting this story on Facebook! And kudos to the Phillies front office for reaching out the way they did. 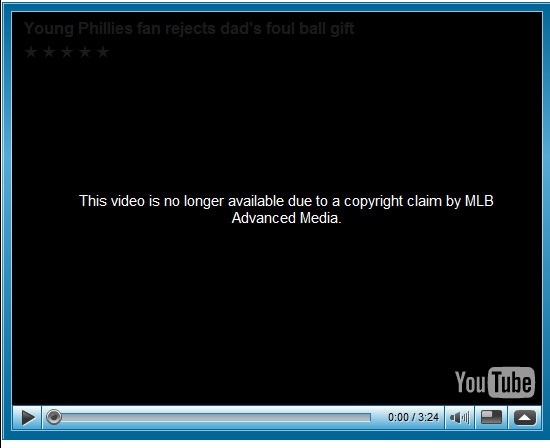 Update (Friday, Sept 18, 2009, 1:52 PM ET): Major League Baseball forced YouTube to pull down all copies of the video. You can read more about it here, and still see an excerpt from the video here.